List Count Your Bloglines Feed Subscribers. ~ The Blog Doctor. You are here: Home > RSS > List Count Your Bloglines Feed Subscribers. 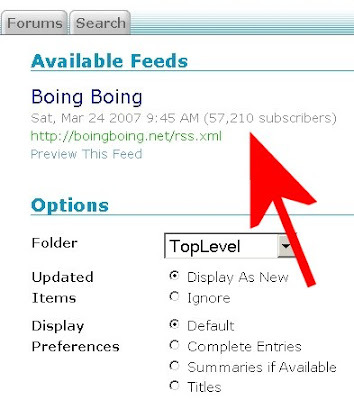 List Count Your Bloglines Feed Subscribers. Bloglines is a "news aggregator" which takes many online information services like weblogs which broadcast their content to the web in so-called "syndicated feeds" or "news feeds" with new technologies like Really Simple Syndication (RSS) and ATOM. You can subscribe to a blog feed and read all that it has to offer without visiting the blog itself. If you subscribe to all the feeds from the blogs you visit it helps you by not having to visit each blog individually to read its contents. You can choose and select to visit only the blog which really piques your interest and the rest you can read at Bloglines. Feeds are important since all the search engines index them and follow their links to your blog. Hence the more readers you have the better your blog is placed in search engine rankings. You can place advertisements in your feeds and hence the number of readers becomes of great significance to your Ad. revenue. Feedburner takes your blog feeds modifies them and puts them out as a different URL. To see your readers login to Feedburner and click on your feed title. (Assuming that you have already 'burned' your blog feed as shown in Feedburner and Blog Feeds.) For Bloglines the method is different. The number next to the date gives the number of subscribers. Click the Subscribe button at the bottom to subscribe to the feed. The feed name will appear in your sidebar. After you have subscribed to the feed the name will appear in the sidebar. Double click this name to display the feed contents in the right hand pane. Right click the Related Feeds link shown in the diagram below next to number of subscribers. At the top you get the numbers of all subscribers to the feed and below is a list of the subscribers.